Written by Elizabeth Marrkilyi (Katjarra’s neice). Katjarra was born quite close to Kulkurta and Purrungu at a place called Kuun. Kuun is the name of the waterhole there. Kuun is also the name of the yellow ochre. 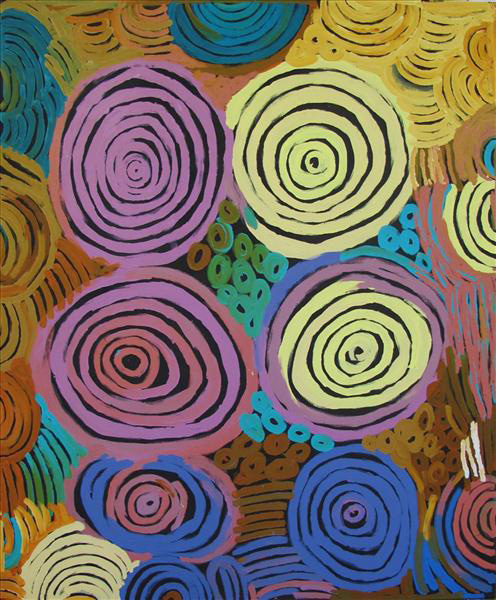 There is also a place very close to Kuun that Katjarra refers to as her home and is one of her Tjukurrpa or dreaming which she paints. It is called Kuurmankutja. This place is home to the two Kuniya (python) dreaming. The other dreaming that she paints is Marrapirnti. 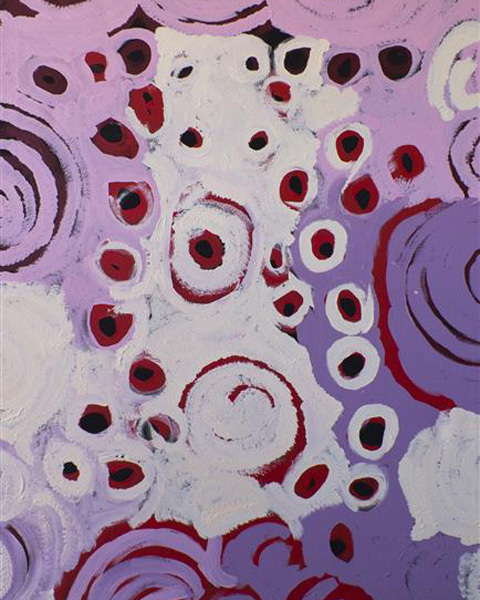 Her father was Lilyiwara Tjungurrayi and her mother was Mangkatji Nangala. 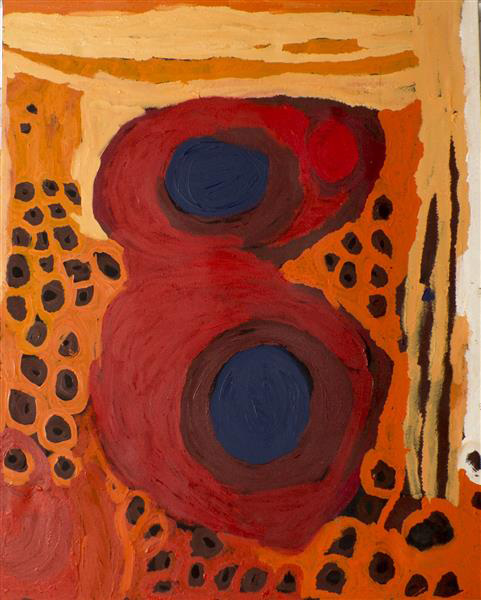 Katjarra had an older sister Nguya Napaltjarri and younger brother Peter Tjanpaltjarri, now both deceased. 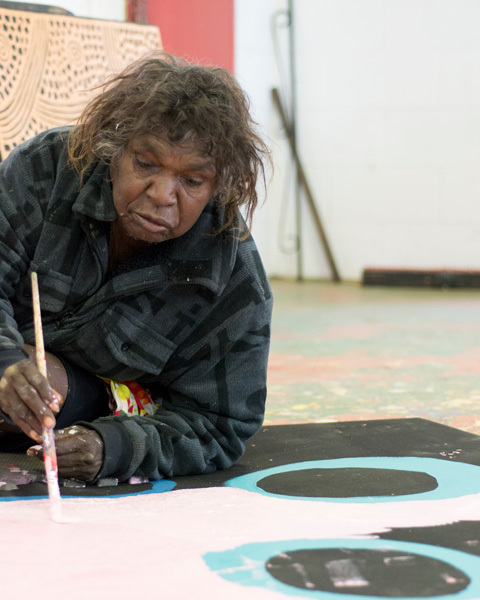 Katjarra lived with her parents, siblings and immediate family in the bush as a child, teenager and young married woman. She lived with her family and later with her husband in the country to the west of Tjukurla in the Kulkurta area which is south of the Baron Range in Western Australia. Katjarra lived a traditional nomadic lifestyle only, travelling families within their family’s country and lived off the animals that they huntedand bush food that they collected. They collected and drank water from the rockholes, soakages, springs and claypans (waterholes). All the travelling was done on foot.